Education plays a very important role in one’s life as it imparts knowledge, values and awareness. Now-a-days it is must for the overall development of a person. With the advent of technology and globalization with Distance Learning, we have been exposed to many more avenues and careers, which has invaded the conventional education system and opened the gate for international schools and methods. We need to be follow the international standards of education to make a bright future for students of the nation. Distance Learning through video conference software and hardware is the answer for impart quality education to each and everyone and to reach the international institutes without thinking of the expenses involved. Despite the tremendous efforts of the government there are still a large number of illiterates in our society. The problem is that there are still many places which are not accessible for teachers. The government can set up video conferencing centers in the nearby towns with its different nodes in various interior regions. With this facility it is much easier for the teachers to reach the students and educate them. The time has come to give our students the taste of the real life. Students retain the knowledge for a longer time which they have experienced themselves instead of being told. They can be taken to different parts of the world to show them the real picture, they can witness a live surgery going on in the OT, they can see the flora and fauna sitting in their class, they can share their experiences with students of other countries; all this is possible with video conferencing setup in the schools. In smaller cities it becomes very difficult to get a foreign language teacher and with globalization it has become necessary to learn one or two foreign languages. The best option for this is to get some online teacher. But for proper learning, classroom environment is must. 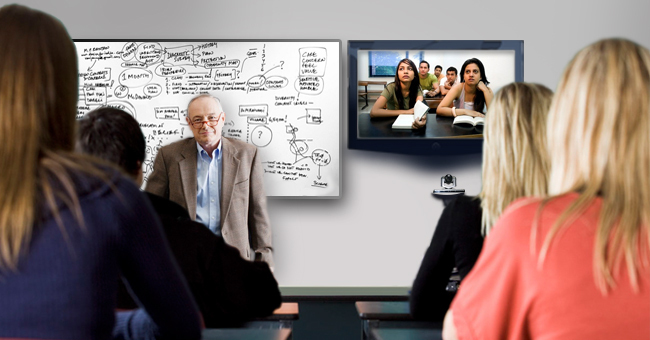 Not a problem with Educational Video Conferencing at our side, we can create a virtual classroom. There are many of us who want to give the best to students, but due to lack of resources and facilities it becomes impossible. But not anymore. Now you can have access to many of your students and many teachers like you with whom you can discuss, plan and execute in your real classroom. A lot of research can be done online for implementation of new methods of education by adding Distance Learning system. Guest lecturers can be arranged for students with prominent personalities and scholars at your school or college through video conferencing which will save a lot of money and time. The virtual classrooms are better than the conventional classroom with amazing sound quality and high definition view of the lecture. The classroom will become a lot more fun with live classes, online activities, virtual debate competition, live practical classes, and meeting different people under one roof, learning by experimenting. This is the beginning of a new era which will open a whole new world of opportunities in education setup. The Video Conferencing setup is cost effective, time saving, gives best quality of education from all around the world at your doorsteps, and has stupendous success rate and incredible results. So every good school should have a video conferencing setup. I am curious to find out what blog system you are using? I’m having some small security problems with my latest blog and I’d like to find something more safe. Do you have any solutions?